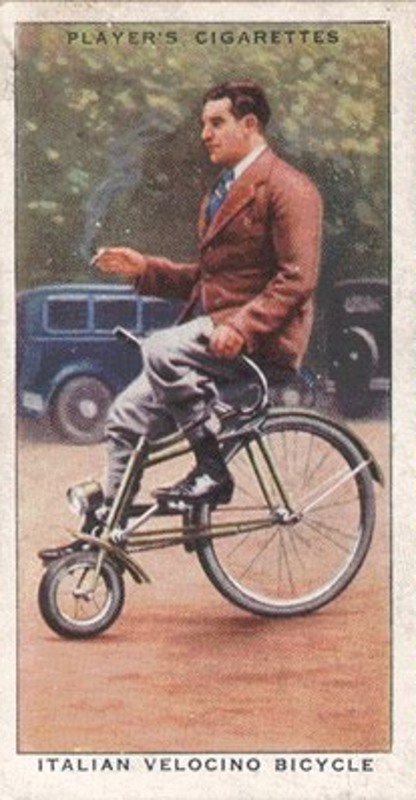 I appreciate the Italian insouciance demonstrated by the bicycle rider on this old cigarette card. That's the way to ride a bike, with bravado and a shirt and tie, not like some craven wet lettuce. A fag in the hand accentuates this 'damn you' attitude. The chap's wearing sensible shoes, but he might also consider — if he weren't a picture — these classically modernist cycling shoes from William Lennon. I don't mention the readies very often, because what price quality, but the Arturo are a simply brilliant price for shoes that they make to order themselves on a wide British last. The shoes are nice enough to be worn off-bike. Consider them for when you'll be dancing on a talcum-powdered dance-floor to northern soul classics. It is a fun bicycle. Excellent! Thanks for the tip. I'd love to try it myself. I'm so glad that I saw your blog because it so interesting and I'm amazed for the photos you shared here. I hope you would share a more interesting post. Thanks!